THIS PRODUCT HAS BEEN DISCONTINUED. PLEASE CONTACT US FOR THE REPLACEMENT OPTIONS. Low cost and compact, the Series A1N Pressure Switch is a UL-recognized component control for water, oil, and non-combustible gas service with an electrical rating of 5 amperes at 125/250 VAC. 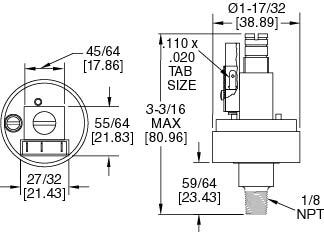 The Series A1N control is available in field adjustable operating ranges from as low as 1.5 to 4.5 psig (10.3 to 31.0 kPa) up to 41 to 100 psig (283 to 690 kPa). A low temperature option of -20 to 180°F (-29 to 82°C) is available. Wetted Materials: Zinc chamber and Buna-N diaphragm. Temperature Limits: 0 to 180°F (-18 to 82°C). Low temperature models: -20 to 180°F (-29 to 82°C). Pressure Limit: 200 psig (13.8 bar). Switch Type: SPDT snap switch. Electrical Rating: 5 A @ 125/250 VAC, 1/10 HP @ 125/250 VAC. Electrical Connections: .11 x .02 quick connect tabs. Process Connection: 1/8" male NPT. Mounting Orientation: Within 20° of vertical. Set Point Adjustment: Slotted screw. Weight: 6 oz (.17 kg). Number Range, PSIG Range, kPa Typical Deadband in psig (kPa) at min./max.